People and technology are increasingly intertwining, which does not result in the question whether technology is going to replace your workforce, but how you can strategically initiate a workforce transition, leveraged through reskilling measures, enabling you to realize the maximum potential of your technology with a skilled workforce. Modern technologies such as AI and Automation, have found their ways from Silicon Valley to companies in every part of the world, operating in various business environments. Companies seek to integrate AI and Automation into their core businesses and are confronted with the profound impact these technologies have. The numerous advantages of AI and Automation are evident and next to the improvement of cost positions and productivity, companies benefit from less human errors and reduced employee costs. Whereas the recent past was governed by companies hesitating to dare a second thought about implementing such technologies in the first place, multiple organizations are now getting braver and targeting to exploit the benefits of AI and Automation technology. Years of business practice paired with modern economic science have taught companies to evenly accompany the integration of novel technology with matching change management projects. But something crucial for the long-term success of integrating AI and Automation technology is still missing. 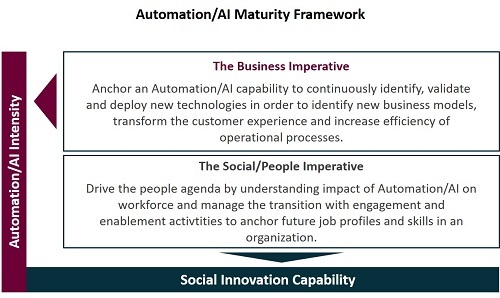 Companies neglect to define which new skills are required to successfully accompany this technology-driven transformation. They also underestimate the extent to which the integration of technology affects their workforce and entire job categories. Studies show, that 14% of today’s jobs are risked by the impact of modern technology. Jobs as we know them today will significantly change due to the influence of Automation and AI. By 2020, skills we currently do not perceive as crucial are prognosed to gain significant relevance. Rather than merely regarding technologies and their threats to conventional job profiles, the chances for organizations and employees need to be explored. The central question is thus not whether to decide for either technology or employees but rather how to sustainably find a way to integrate both, business and people. Companies will achieve digital leadership, if they succeed in balancing and maximizing the value from AI and Automation while managing that the workforce is skilled and equipped to realize the maximum potential of the new technologies. This skill transition needs to be actively planned and implemented by the organization. We have gathered comprehensive experience in finding solutions for navigating both people and technology. The workforce skilling topic is of increasing relevance to enterprises on a global basis as seen by the fact that Walmart is investing multiple million dollars in organizations that try out reskilling solutions. To source the largest potential of new technologies, we support you in identifying which jobs and skills can be more effectively executed by technologies and how you can integrate skilling initiatives, such as internal and external talent acquisition measures, to develop your workforce to more effectively complement technological advantages. Also, we consider training measures as a key to effectively navigate people and technology. This is also supported by studies, which show that 46% of organizations name “Employee training” among their top 5 investment areas in AI technology. How can you now navigate both, people and technology? We have identified five success factors, which will enable your organization to set up a holistic workforce transition program. Design End-To-End. Create a meaningful vision and interlink it with the business strategy and concrete implementation measures, which enable the guidance of people at every level through the workforce transition. Empowerment-based. Focus on building strengths, such as entrepreneurship, and provide necessary resources for a continuous development approach. Ecosystem-oriented. Source the expertise and capacities of an ecosystem to conduct respective skilling measures. Human-centered. Focus on the workforce, their assets and their needs. Long-term focused. Keep the long-term strategic horizon at focus, while creating tangible short-term outcomes. We collaborate with Faethm, a service provider for AI technology, to predict the impact of technology on skills and roles in future and equip the workforce of our clients with the skills they need. Faethm’s technology combines public and client data with proprietary analytics and machine learning to deliver insights about future economic and social value. To initiate our clients’ workforce transition, we use the insights about the impact of technology on specific jobs provided by the AI solution. Paired with the information about the exposure of jobs to Automation-impact over time significant skill gaps and existing job transition options are extracted. Based on these finding, we design our clients’ workforce transition process, entailing future proof job alternatives, job corridors to reach these job profiles and customized re-skilling solutions. To support your transitioning workforce best, we started transitioning the workforce at Capgemini itself. This internal project was initiated upon recognizing, that our desired strategical direction and the integration of technology is not reflected by the skills we were possessing at that point in time. The aim was to create a proactive Learning and Development program, reflecting the rapidly changing technology landscape and ensuring relevancy to market. We identified the required core skills, matching our strategical outline with regards to technology. After identifying these skills, we built a Skill Value Framework, mapping the required capabilities for a harmonious interplay between technology and skills. To start shaping the navigation of technology and people, we aligned the added skills to our current development framework and implemented matching Learning & Development programs.